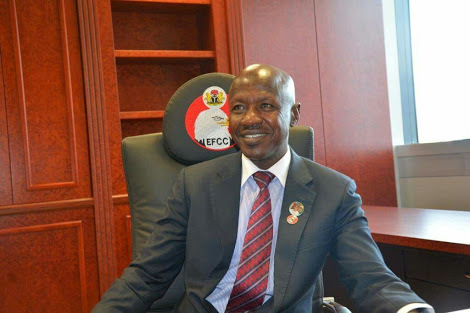 EFCC Chairman Reacts To Ganduje's N10m: "We Don't Accept Donations From Governors"
The Economic and Financial Crimes Commission, EFCC, has denied receiving N10million donation from Kano State governor, Abdullahi Ganduje, to organise anti-corruption marathon. A statement by Ganduje’s spokesman, Aminu Yassar, said the governor had donated the money to EFCC, ICPC and Athletic Federation of Nigeria for the anti-corruption campaign. “The attention of the Economic and Financial Crimes Commission, EFCC, has been drawn to a trending story in the social media concerning a purported statement credited to the media aide of the Kano State governor to the effect that the Commission got a N10million donation from the state government. “It is therefore very shocking to read of a purported donation of N10million to the Commission. The story is not only unfounded but very mischievous. “For the avoidance of doubt, no state governor or some other individual or group has donated any amount of money to the EFCC to carry out the Anti-corruption Marathon project or any other project for that matter."